In some Vermont classrooms, the students would be scratching out answers on paper with pencils. The quizzes would go home with the teacher, and the kids would get their grades in a day or two. But on a recent Monday morning, there isn’t a pencil in sight. Instead, each student is taking the quiz on a brand-new iPad supplied by the school. Students are working in groups, their iPads synched to the teacher’s, and each group’s score is projected onto a screen in real time. Skerrett calls it the “space race” because each group is represented by a cartoon spacecraft. The more answers they get right, the faster the ship zooms across the screen. The exercise gives Skerrett an instant read on how well the class understands the terminology so she can tailor her teaching accordingly and focus on the students who aren’t getting it. Plus, she says, the kids love the game. “I never would have thought spaceships going across a screen would be so exciting for eighth graders,” Skerrett remarks during a break in the action. Bellows Free Academy Fairfax, part of the Franklin Northwest Supervisory Union, is just one of several Vermont schools employing iPads in the classroom. The Vermont Department of Education’s technology coordinator, Peter Drescher, says he doesn’t know how many other schools are doing the same — and won’t until he gets results from an annual survey in December. But he’s certain the number is growing. At BFA Fairfax, iPads were issued to every seventh and eighth grader — and their teachers — at the start of this school year. In nearby Fletcher, fifth and sixth graders got them, too. The plan is to add a grade a year until all students in the district have their own iPads, says superintendent Ned Kirsch. Starting this week, students will be able to earn the privilege of taking their iPads home. BFA Fairfax middle school principal Tom Walsh is equally jazzed about iPads and their power to get kids more excited about learning, in and outside the classroom. Walsh also believes iPads can level the socioeconomic playing field. 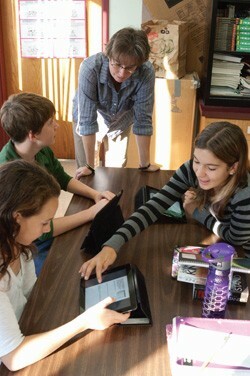 Next door to Skerrett’s classroom, an eighth-grade language-arts class is engaged in iPad learning games. One student is playing “Words With Friends,” a crossword game similar to Scrabble. At a desk alone, a young boy is engrossed in “Math Ninja,” a game whose objective is to defend a treehouse using martial-arts weapons. Walsh asks the boy what he likes about the game. “You get to viciously attack cats and dogs with throwing stars and swords,” the kid says with a perfectly straight face. To reach the next level, however, the player must answer basic math questions, such as 22 divided by 11. Seventh grader Elizabeth Skerrett, the teacher’s daughter, is working on a script for a two-person movie she and a classmate are making about a job interview. They’re writing the script on the NotePad app, shooting it with the iPad’s camera and editing the final cut using iMovie. Franklin Northwest dropped a chunk of change buying the iPads — around $125,000 for 200 tablets this year, or $500 apiece — and spent another $40,000 building a schoolwide Wi-Fi system. But the district did it without raising taxes by leaving vacant positions unfilled and making other cuts here and there, Kirsch says. Finding $125,000 every year — in order to bring additional grades online — will be harder. The district had been issuing Netbook laptop computers to students — and still does in lower grades — but Kirsch sees distinct advantages to the iPad, including longer battery life and less time required to boot up and log on. BFA students’ iPads come loaded with 90 apps, including email and an Internet browser, but no Facebook or Twitter. Rural Vermont might seem an unlikely place to find high-tech classrooms, but towns such as Enosburgh have been early leaders in the adoption of the so-called “1-to-1” iPad initiative. Enosburgh, which is part of the Franklin Northeast Supervisory Union, was the first town in the state to issue iPads to every student in the high school — about 350 — as well as 60 students in elementary school. Even kindergarteners in Enosburgh have access to iPads, which they use to learn the alphabet, says Robert Gervais, director of technology for town schools. Gervais says the “engagement factor” of iPads has reduced “gossiping” and other time wasters in the classroom. He even credits the iPad for a 67 percent drop in disciplinary actions at the high school this year. It’s worth mentioning: If a kid breaks a school-issued iPad through negligence, the student’s parents have to pay for it. “I’ve had discussions with administrators who handle the discipline issues, and they think a lot of it has to do with being responsible for a $500 device, and less of the ‘knock the book out of the hands of the kid walking down the hall’ kind of attitude,” Gervais says. Not all parents were thrilled about the idea — or the potential price tag — of entrusting their middle schoolers with iPads. Angela Baker, who was “a little hesitant” for her 11-year-old daughter, a seventh grader at Bellows Free Academy Fairfax whom her mother describes as a “good student,” to receive one. But Gracie’s enthusiasm for school has “skyrocketed” because of the iPad, her mother acknowledges. Still, she worries about her daughter’s safety. In the 200-student Essex North Supervisory Union — serving the far-flung towns of Norton, Lemington, Canaan, Brunswick and Bloomfield — technology coordinator Tom Mays is hoping to introduce iPads districtwide by next year. Mays firmly believes that “an understanding of technology is more important now than ever,” but admits the demographics and lack of high-speed Internet access in that section of the Northeast Kingdom present challenges to integrating technology into education. Some kids would take their iPads home to a fully wired household, while others would find the tablets all but useless the second they left school, Mays says. Will iPads actually improve learning? And how will schools measure that? “That’s the hard part,” says Walsh, the Fairfax principal. He says that progress can be calculated through levels of student engagement, grades and state testing benchmarks. Grabbing kids’ attention with flashy new iPads is the easy part; but for it to work, teaching has to change, too.